Families have different reasons for adding a dog to their households. Some are looking for playmates for their children, some for companionship in their old age, some for protection, and still others for hunting or for showing. And as you might expect, there are certain types of dogs that are better at each of these functions than others. Each breed of dog originated for a specific function. Although many also make fine companion dogs, it is wise to do the research on any breeds you are considering adding to your family before you begin looking for a specific dog. For example, you would likely not think about buying a Chihuahua and expecting him to be fabulous at helping you hunt wild boar. There are many sources you can turn to for information on a wide variety of breeds. Of course, you can get started by reading the breed guides on doggies.com! If you prefer paging through a book, you might consider Roger Caras Dog Book: A Complete Guide to Every AKC Breed from Dorset Press, or Paws to Consider: Choosing the Right Dog for You and Your Family by Brian Kilcommons and Sara Wilson from Grand Central Publishing. Going to dog shows will help you to compare different dogs and allow you to talk to trainers. Especially at smaller shows, most of the handlers are more than willing to tell you about their favorite breeds and answer your questions. A caveat to this approach: your dog will never look as well-coiffed as the dogs in the shows. Show handlers are fanatic about maintaining their dogs’ looks. Attending a show will give you a good idea of the size and overall appearance of each breed. Think about how much room you have in your home. Will you be able to handle sharing your living space with a 200-pound dog? Do you have lots of knick-knacks at tail level, just waiting to be knocked over? At a show, many of the dogs are excited, so they may all be barking, but some dogs are actually less prone to barking than others. This can be an important consideration if you have close-by neighbors who may be less than thrilled with a four-legged alarm clock that goes off at all hours of the night. Some dogs will be better suited to being either inside dogs or outside dogs. Some require a lot of human companionship, while some are more aloof. You must consider whether you want a snuggler or an independent thinker. Some breeds need tons of exercise while others are content to go outside only to do their business a few times a day. Compare these needs to the amount of time you have available to care for your dog. Remember that your dog is likely to live anywhere from 8 to 15 years, so this is a long-term commitment that you are making. The American Temperament Test Society in Texas has conducted testing on dogs at least 18 months of age in the areas of behavior towards stranger, reactions to touch, sights, and sounds, and self-protection / aggressive tendencies. A dog is considered to have failed if he shows any sign of unprovoked aggression, panic without recovery, or strong avoidance of any of the challenges. Of all dogs tested, about 81.5% passed the test. The percentage of dogs who passed the test from some of the more common breeds are shown here, and the complete list is available at ATTS.org. Just as there are differences between breeds, there are also differences between individual dogs within a breed. Whether this comes from nature, nurture, or a combination of both, is a matter for debate, but it is certain that differences in personality exist. Certainly, the environment at the breeders’ place of business helps to determine how the dog will turn out, as is the way in which you socialize and train your puppy. But, before you choose a specific puppy from a breeder, what can you do to raise the chances of a good fit between the new pup and your family? One way to differentiate between the puppies in a litter or from different breeders is to use the Puppy Aptitude Test developed by Jack and Wendy Volhard. This test rates a new puppy on ten attributes: degree of social interaction, willingness to follow a person, degree of dominance or submission, acceptance of a person’s dominance, degree of submission when the dog is unable to control his surroundings, willingness to do something for you, sensitivity to touch, sound, and sight, and startle response. The Volhards recommend that you test a puppy at the age of 49 days, after his nervous system has developed sufficiently, but before the dog begins to be socialized by the way he is treated. There is no “good” or “bad” judgment with the test; it is simply used as an indication of which puppy best matches your expectations. To conduct a puppy test, the dog should be taken to an area that is unfamiliar to him, accompanied only by the tester and the scorer. Neither person should be familiar to the dog, and neither should be the person who is trying to sell the dog. Each dog is taken to the testing area individually, before being fed, and when he is at his liveliest. Puppies should not be tested on the day they are vaccinated or immediately afterward. Social attraction is tested by seeing if the puppy comes to the tester when encouraged to do so. Following is tested by seeing how willing the puppy is to follow the tester when he or she walks away from the dog. Dominance and submission are judged by gently restraining the puppy on his back for 30 seconds. Acceptance of a person’s dominance is checked by stroking the dog gently after releasing him from being held on his back. If the dog has a forgiving nature, he will lick the tester’s face. To see how the dog reacts when he is unable to control his surroundings, the tester cradles the dog and gently lifts his feet off of the ground, holding for 30 seconds. The degree to which the dog is willing to “help” is tested by throwing a piece of crumpled paper for the dog to retrieve. 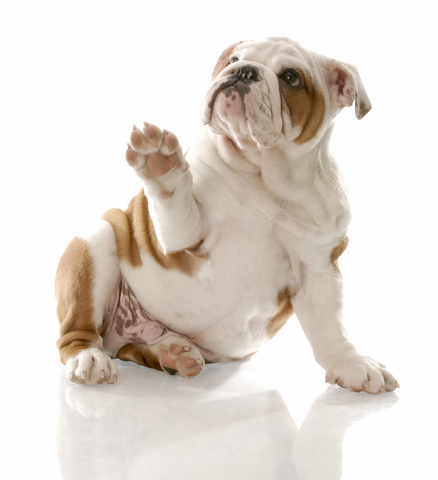 Touch sensitivity is measured by pinching the webbing between the dog’s front paws. Sound sensitivity is tested by banging on a metal pan. Sight sensitivity is judged by pulling a towel across the testing area to see if the dog attacks it or is scared of it. Stability is checked by opening an umbrella near the puppy to see if he goes after the umbrella or runs from it. Each test is scored on a scale of 1 – 6. Dogs who have low scores are likely to be pack leaders and may be difficult for a first-time guardian to handle. They are not likely to be good with children. Dogs in the middle of the ratings will likely be good with children and not too hard to train. They will need lots of exercise. Dogs with high ratings will be more independent and may be less likely to bond with your family. A complete guide to the Puppy Aptitude Test can be found at www.Volhard.com. i was wondering why people would breed dogs when there are hundreds of dogs that get killed every day because nobody adopted them?